For over 70 years, Glaro waste receptacles have built a reputation for their attractive, functional, durable, and versatile qualities. Glaro waste receptacles are available in 31 designer finishes and hundreds of finish combinations. Choose Glaro waste receptacles for any facility. All Glaro waste receptacles are in stock or ready for shipment within days. Glaro waste receptacles are engineered and manufactured for durability at our New York plant. 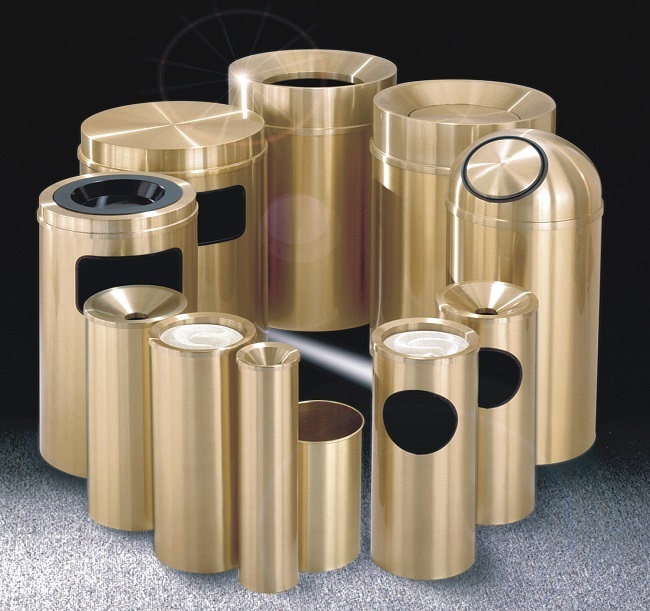 These waste receptacles have heavy gauge, aluminum covers, hand spun and satin polished for the finest finish in waste receptacles. All covers for Glaro waste receptacles have finishes that keep the waste receptacles looking new. 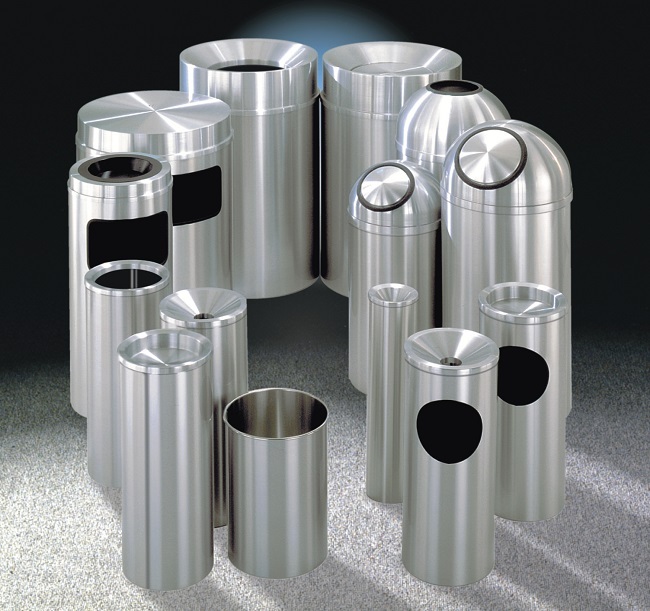 The bodies of the waste receptacles are constructed of aluminum or galvanized steel. 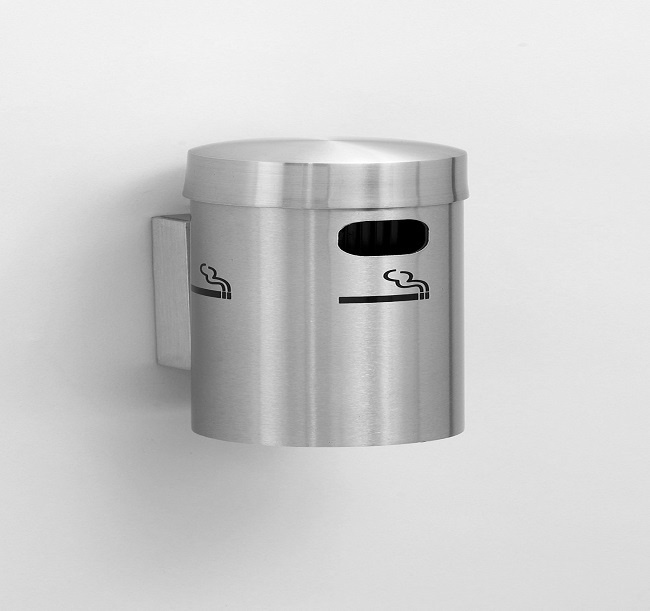 The waste receptacles are weather-protected with a baked-on powder coating. Plastic interior liners, for easy trash removal, are standard for all Glaro waste receptacles. All parts of the waste receptacles are rust, corrosion, and fire resistant. All Glaro Waste Receptacles are constructed and packed with recycled materials. Glaro waste receptacles themselves are recyclable. Great care is given to minimize waste in the manufacturing process of our complete line of waste receptacles. 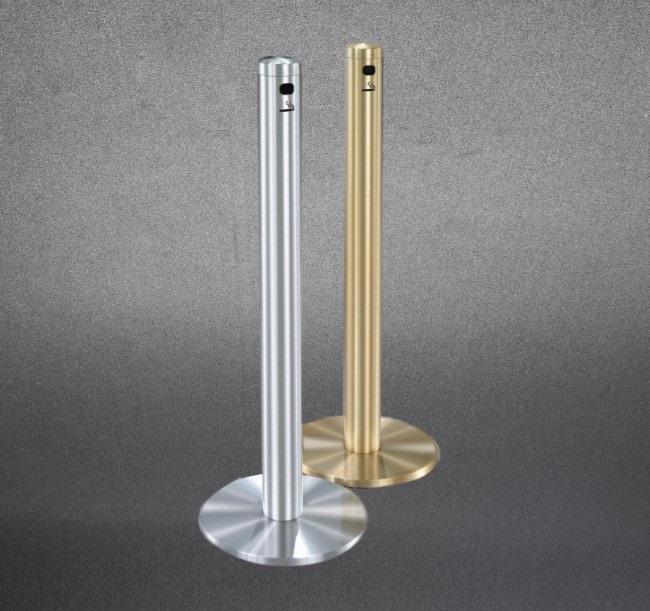 Glaro waste receptacles are available in tarnish-proof satin brass and satin aluminum finishes. 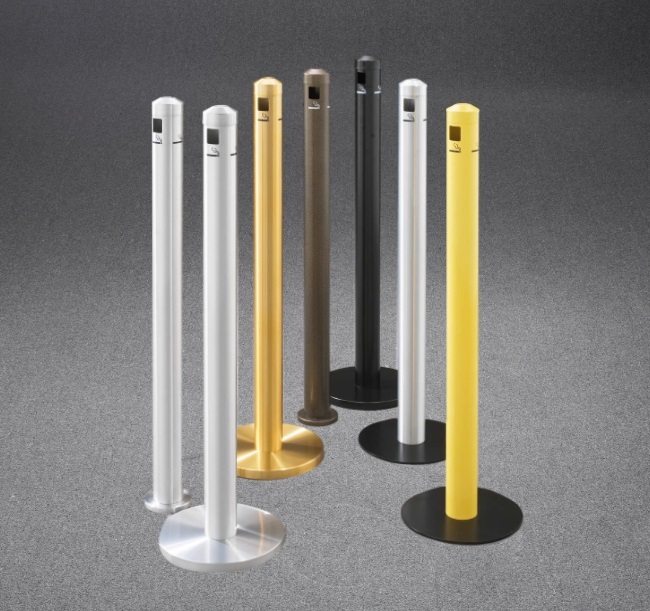 All finishes for waste receptacles have powder-coat protective surfaces. Glaro waste receptacles are also available in 27 textured and smooth powder coat finishes. Customers can customize waste receptacles by choosing one finish for the bodies of the Glaro waste receptacles and another for the covers of the waste receptacles. 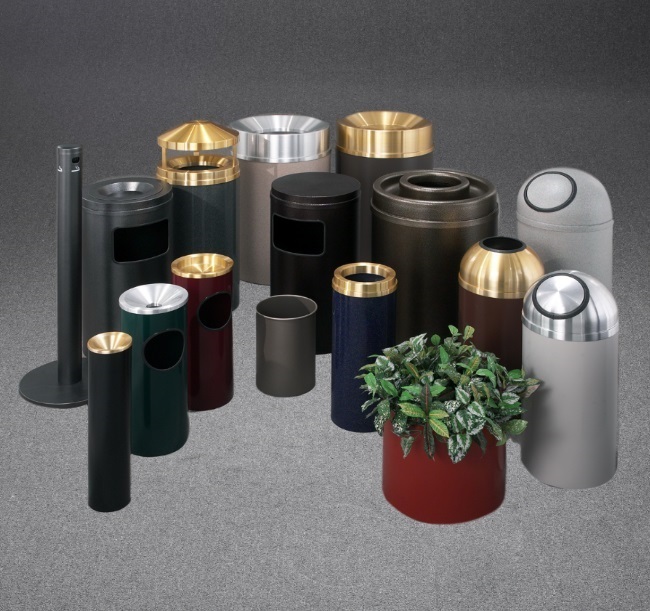 No other manufacturer offers this diverse choice for waste receptacles. The “New Yorker” Satin Aluminum Waste Receptacles are recognized in the marketplace as a premier line of waste receptacles. These waste receptacles are known for their conservative, dignified look, and easy-to-maintain finish. 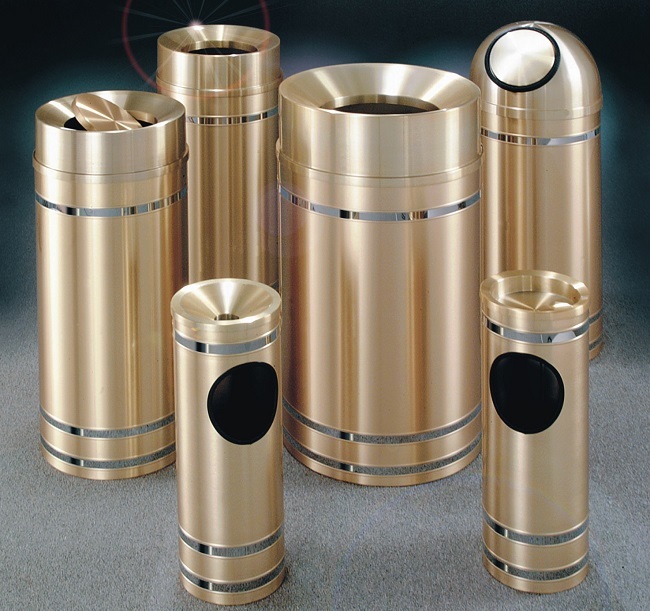 The “Atlantis” All Weather Satin Brass Waste Receptacles are guaranteed to be tarnish and rustproof. 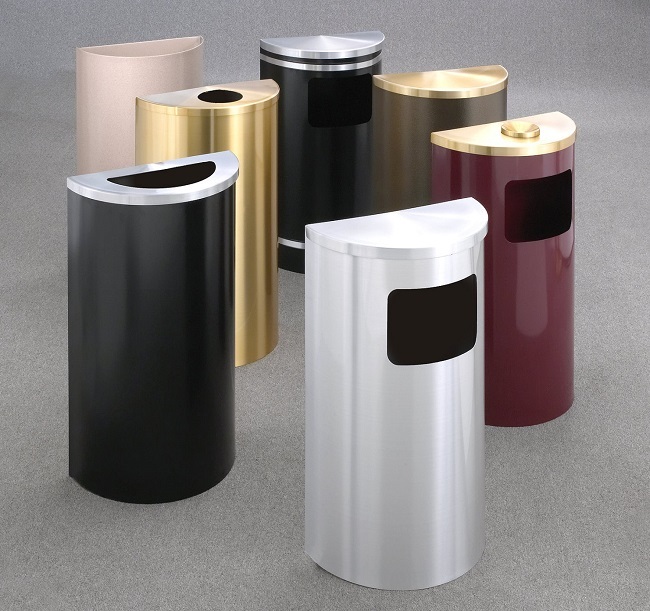 These waste receptacles have a rich, elegant, durable finish. 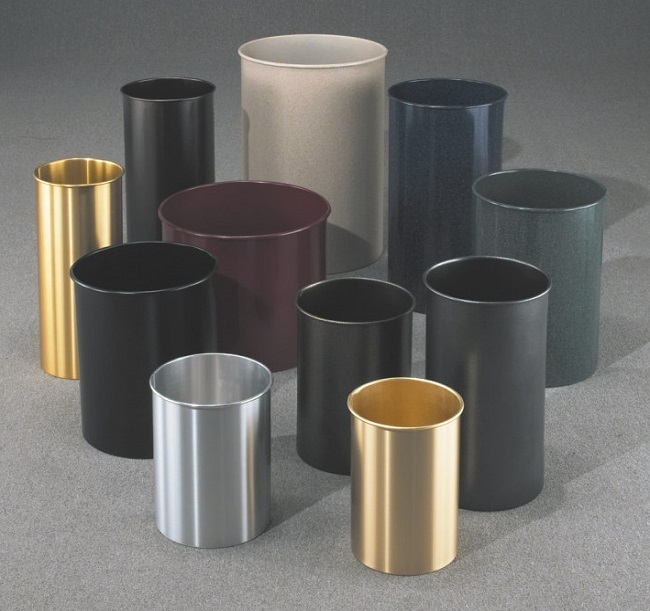 The “Capri” Banded Satin Finish Waste Receptacles are manufactured in tarnish-proof satin brass or satin aluminum, accented with contrasting metal bands. These sophisticated waste receptacles are beautifully detailed. The “Mount Everest” Waste Receptacles are available in over 30 models and hundreds of finish combinations! These galvanized steel waste receptacles are Glaro’s most economical waste receptacles. 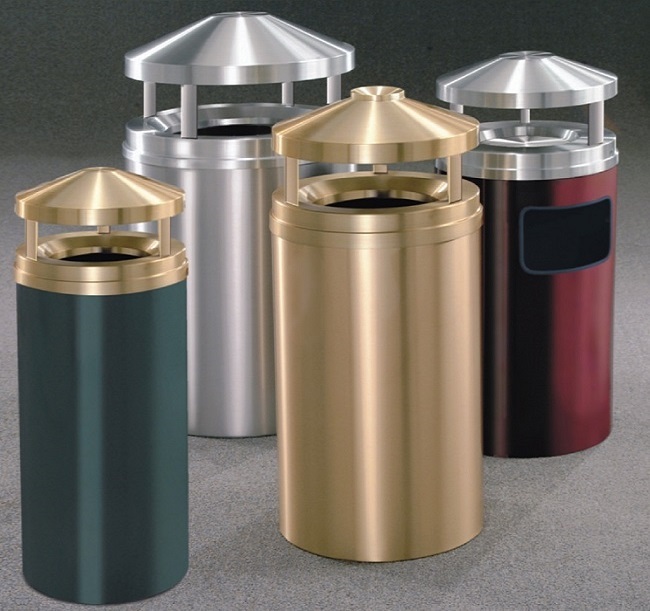 These waste receptacles are available in 29 designer finishes with satin aluminum, satin brass, or matching covers. The “Monte Carlo” Banded, Waste Receptacles feature a stylish upscale and distinctively customized appearance. 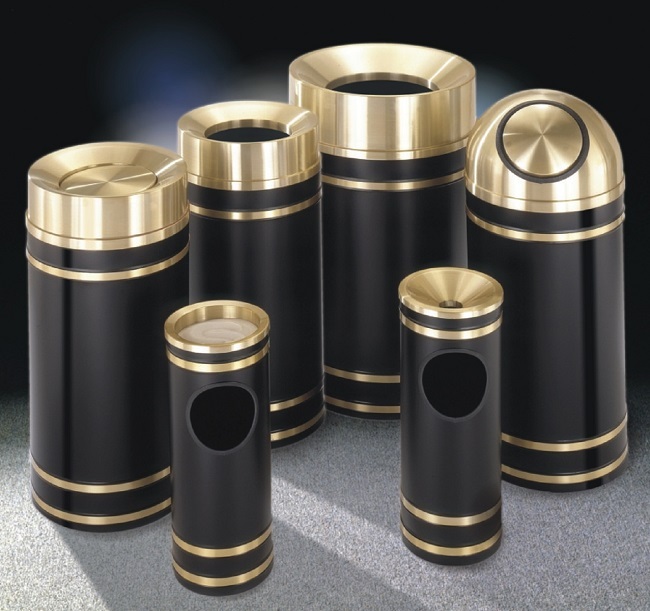 Decorative bands with matching covers make these waste receptacles stand out from all others. 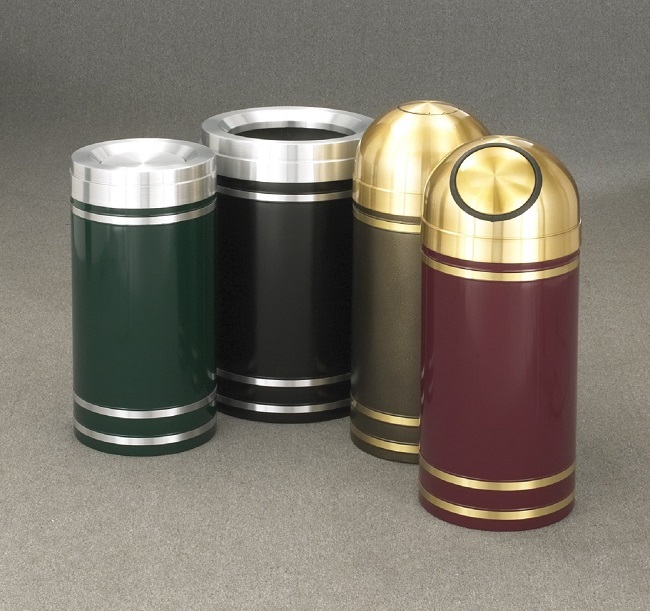 These waste receptacles are available in 29 powder coat finishes. The “Canopy Top” Waste Receptacles feature style, function and durability. These waste receptacles, originally designed for the outdoors, have also become indoor favorites due to their decorative appeal.